Be the first to share your favorite memory, photo or story of Jacqueline L.. This memorial page is dedicated for family, friends and future generations to celebrate the life of their loved one. 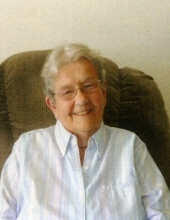 Jacqueline L. “Jackie” Jaynes, 86, of Grinnell died on January 15, 2019, at the Mayflower Community Health Care Center. A gathering to share stories, prayers and scriptures has been scheduled for 2:00 p.m. Wednesday, January 23rd, at Mayflower Beebe Hall 2nd floor activity room. Memorial contributions may be designated to Habitat for Humanity. Jackie was born on February 4, 1932, in Marshalltown the daughter of Robert and Margret Robinson Collins. She was raised in Marshalltown and was a 1949 graduate of Marshalltown High School. She later received her AA degree at Marshalltown Community College. On September 9, 1953, she was united in marriage with Russell E. “Rusty” Jaynes, in Marshalltown. The couple moved to Anaheim, California where they raised their daughter, Janet Lee “Jan”. After her divorce, she returned to Marshalltown in 1980 where she owned and operated a bar for 3 years. She then started a housecleaning business, “Houseclean by Jackie” and was self-employed cleaning homes in Marshalltown and later Grinnell after moving there in the late 1980’s. Jackie was a member of the Grinnell First Presbyterian Church and was the church custodian for several years. She was very faithful and religious. She was an active volunteer with Habitat for Humanity affiliate for Poweshiek County, serving as president for 7 years, MICA, and with a local share food program. She was an avid reader, a devoted Clifford the Big Red Dog fan, and held a passion for golf. She loved people, long conversations, and held a love for animals. She is survived by her daughter, Jan Jaynes of Midway City, California and very special friends, Lacey and Dan Mason of Kellogg. She was preceded in death by her parents and her sister, Jill Criswell. To send flowers or a remembrance gift to the family of Jacqueline L. "Jackie" Jaynes, please visit our Tribute Store. "Email Address" would like to share the life celebration of Jacqueline L. "Jackie" Jaynes. Click on the "link" to go to share a favorite memory or leave a condolence message for the family.